Figure 3-11.Development cycle of a geostrophic wind. line and with the same speed unless acted upon by some external force. Therefore, for a body to move in a curved path, some force must be continually applied. The force restraining bodies that move in a curved path is called the centripetal force; it is always directed toward the center of rotation. When a rock is whirled around on a string, the centripetal force is afforded by the tension of the string. Newtons third law states that for every action there is an equal and opposite reaction. Centrifugal force is the reacting force that is equal to and opposite in direction to the centripetal force. 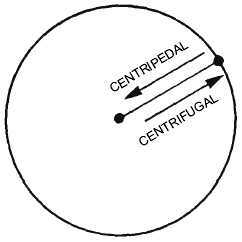 Centrifugal force, then, is a force directed outward from the center of rotation. As you know, a bucket of water can be swung over your head at a rate of speed that allows the water to remain in the bucket. This is an example of both centrifugal and centripetal force. The water is held in the bucket by centrifugal force tending to pull it outward. The centripetal force, the force holding the bucket and water to the center, is your arm swinging the bucket. As soon as you cease swinging the bucket, the forces cease and the water falls out of the bucket. Figure 3-10 is a simplified illustration of centripetal and centrifugal force. High- and low-pressure systems can be compared to rotating discs. Centrifugal effect tends to fling air out from the center of rotation of these systems. This force is directly proportional to the wind speeds, the faster the wind, and the stronger the outward force. Therefore, when winds tend to blow in a circular path, centrifugal effect (in addition to pressure gradient and Coriolis effects) influences these winds. Frictional Force The actual drag or slowing of air particles in contact with a solid surface is called friction. Friction tends to retard air movement. Since Coriolis force varies with the speed of the wind, a reduction in the wind speed by friction means a reduction of the Coriolis force. This results in a momentary disruption of the balance. When the new balance (including friction) is reached, the air flows at an angle across the isobars from high pressure to low pressure. (Pressure gradient force is the dominant force at the surface.) This angle varies from 10 degrees over the ocean to more than 45 degrees over rugged terrain. Frictional effects on the air are greatest near the ground, but the effects are also carried aloft by turbulence. Surface friction is effective in slowing the wind to an average altitude of 2,000 feet (about 600 meters) above the ground. Above this level, called the gradient wind level or the second standard level the effect of friction decreases rapidly and may be considered negligible. Air above 2,000 feet normally flows parallel to the isobars. WIND TYPES Since there is a direct relationship between pressure gradient and wind speed and direction, we have a variety of wind types to deal with. We discuss below the relationship of winds and circulations, the forces involved, and the effect of these factors on the general circulation. Geostrophic and Gradient Wind On analyzed surface weather charts, points of equal pressure are connected by drawn lines referred to as isobars, while in upper air analysis, points of equal heights are connected and called isoheights. The variation of these heights and pressures from one locality to another is the initial factor that produces movement of air, or wind. Assume that at three stations the pressure is lower at each successive point. This means that there is a horizontal pressure gradient (a decrease in pressure in this case) for each unit distance. With this situation, the air moves from the area of greater pressure to the area of lesser pressure. If the force of the pressure were the only factor acting on the wind, the wind would flow from high to low pressure, perpendicular to the isobars. Since experience shows the wind does not flow perpendicular to isobars, but at a slight angle across them and towards the lower pressure, it is evident that other factors are 3-10 AG5f0310 Figure 3-10.Simplified illustration of centripetal and centrifugal force.